I have gone out of my way to avoid sharing an elevator with people I know. I’ve paced carpet-softened laps around the office. I’ve gotten trapped in a blue-lit concrete stairwell (emerging, at last, from the ground floor into a trash-drippy alley). I’ve hidden in the bathroom. It’s the small talk that gets me, and also the way we’ll part ways when the doors open, awkwardly adjusting our gaits so we don’t end up walking to the train together. I stand on the buttons-side of the elevator, always, leaning against the wall, primed by the wobbly train to steady myself, maybe, or maybe I’m just lazy. When people enter, I adjust. I don’t remember anyone ever telling me how and where to stand. But I remember the tension created by a coworker who once stood the wrong way, facing the rest of us, his eye contact eerily constant. And I remember the drunk in the library who was escorted out of the elevator by three cops who told me, under the drooping yellow light, to stay on the opposite side until they’d shoved him out on the ground floor. He smelled like old beer and he swayed and hacked a thick cough. Two officers held him upright, and the third, hand on his gun, watched me watching. It’s not that we act weird in the elevator—it’s that we try to act normal, like we’re in a regular room. But it’s an uncanny room, with the physical strangeness of regimented standing, the intellectual strangeness of false anonymity, and the social strangeness of conversations sliced in two: before the elevator comes and inside it, or inside the elevator and after the doors open. And then there are the other conversations, the ones already happening, those you’ll never successfully eavesdrop on fully, coming and going. Do you talk over them? Under and around? Do you pretend not to notice the small dog in the woman’s puffy-coated arms, or the business cards clutched in the man’s left hand, a bike helmet in the other? Most people cope, as we do everywhere else, by turning to our phones. Tweets still flow in most elevators; at this point, there are few places to lose service. The three dots of a correspondent corresponding still linger, pressing possibility. But is it rude, in an elevator with people you know, to spend the vertical commute texting? Nevertheless, we slip into virtual solitude, forget the pulley system, forget the elevator the way we forget the walk to the train or the drive to the office, the details erased by repetition. 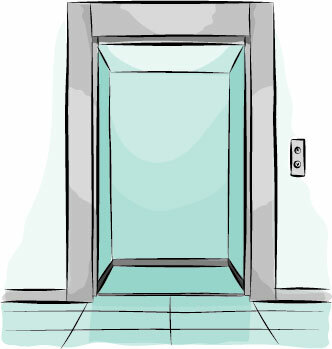 Because an elevator ride is, at its heart, a commute. And it’s therefore the last hope of being alone before shuddering into crowds on the sidewalk or smiling greetings at coworkers or receptionists or whoever awaits when the doors part. It’s not the being alone of alone time, nor is it the being alone of wanting to be with other people but not having other people to be with. It’s more like the being alone that’s necessary for grooming, or for trying out new smiles in the mirror. It’s a vain alone time, and when luck lets you have it, it’s a relief, the way getting someone’s voicemail is after five long rings. I should mention that there’s no thirteenth floor in my office elevator. I learned this from my dad, who works a floor below me. Every time I get on the elevator going down, I hope he’ll appear seconds later, and we’ll notice each other with joyful double takes, glad at the strange potentiality of seeing each other every day. I don’t enjoy sharing an elevator with most people. But the few whom I’m fine with are the ones I can do embarrassing things in front of, the people whom I can ask to check my teeth, whose presence is a relief. They are, in short, the people I love. So when I step into the elevator and watch the red LED number disappear for the split second between floors, I focus on my eardrums and whether I feel that almost unplaceable sense of slowing down vertically. When I feel it, I hope, and I stop staring at the inane advertisements on the screens or the foreshortened foreground whose focus softens in dry air–induced tears, and I look to the doors. Usually, someone I don’t recognize steps on, and I look away. If I’m unlucky, it’s someone I vaguely know, and we fall into small talk that’s small not only because it’s about the weather but also because the chances of ever talking about anything else with this person are slim. Chance is still chance. No amount of wanting ever changed that. But once in a while, once every fifty or one hundred elevator rides, there he’ll be, my father, stepping in. And then we’ll get to where we’re going and whisper “I love you” in front of the people who don’t know we’re related, and we’ll flail into being in public, outside of any room.